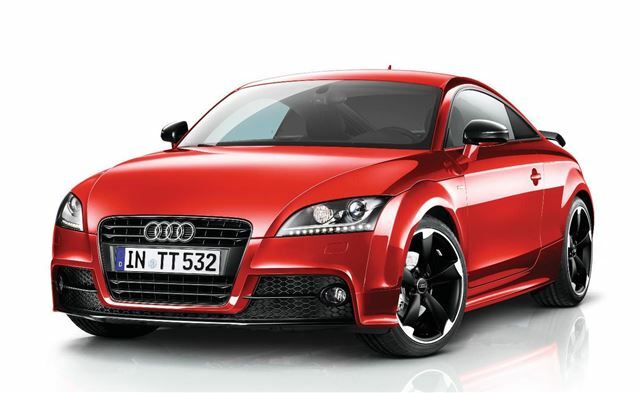 Audi’s Black Edition TT and TT Roadster models are now available with the Amplified Black pack. For an extra £700 the styling pack adds 19-inch ‘Rotor’ alloy wheels, a choice of four paint finishes and styling extras like a TT-RS style fixed rear spoiler. Prices start at £31,365. New details with the Amplified Black pack include a black finished chin spoiler and rear spoiler, along with black door mirror caps, rear diffuser and exhaust pipes. The four paint finishes offered are Glacier White, Misano Red, Daytona Grey or the striking Samoa Orange, the latter of which includes body-coloured interior inlays. Besides these extras there is no change in specification over standard TT Black Edition models, which come with BOSE audio, iPod and phone connectivity, leather and Alcantara upholstery, plus xenon lights. There are two new engines available, though – a 211PS 2.0 TFSI with front-wheel drive or quattro all-wheel drive and a 170PS TDI quattro diesel. The TT 2.0 TFSI manual Amplified Black Edition is priced at £31,365 and prices rise to £36,360 for the 2.0 TFSI quattro S tronic.